Atmospheric, completely detached holiday home, with artistic touch provided by the studio. 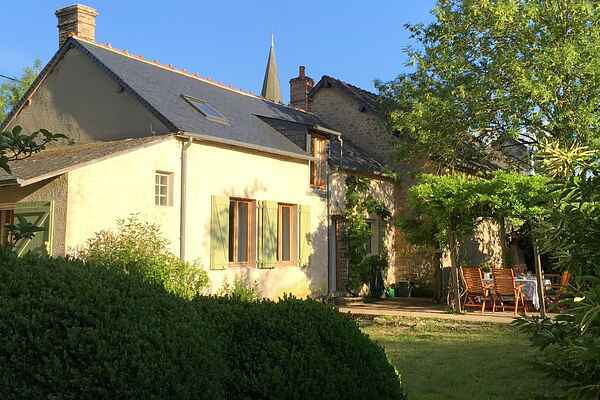 Quietly situated on the edge of the tiny village Tintury, near the beautiful nature reserve of the Morvan. Nice grassy garden with terrace, with a small orchard in the back. Scenic and neat interior: the original floor tiles are typical for this region. You'll find a fishing lake near Fleury (3 km) and recreational lakes with opportunities for water sports near St. Saulge (18 km, also bike rental) and Bazolles (24 km). Also visit the mining museum of La Machine (19 km). Bakery and simple groceries in Rouy (6 km); supermarket, restaurants, swimming pool and tennis court in Châtillon-en-Bazois. You'll find two cultural jewels chock-full of museums and history in the impressive Nevers (32 km) and the Roman Autun (71 km). But outside of the larger cities is also plenty to see; for example the excavations and museum of the Celtic city Bibracte (known from Caesar's campaigns) near Glux-en-Glenne (43 km). Your direct surroundings also harbour a large number of castles, like near Châtillon-en-Bazois (10 km), Vandenesse (24 km) and the health resort St.-Honoré-les-Bains (32 km).